acquisition of real property for a public purpose and matters directly related to the acquisition; 2) to obtain legal advice and consult with staff, consultants, or other individuals about potential litigation related to a land use matter." Mayor Bridget Donnell Newton noted that the wording on the agenda didn't match that of the earlier request for the closed session, which came after a meeting among Councilmember Mark Pierzchala, City Manager Rob DiSpirito, and City Attorney Debra Yerg Daniel. "This is accurate language," Daniel replied. Newton then took issue with Pierzchala's proposed exclusion of Conway from the closed session. Pierzchala said there was a "particular invitation list to this closed session, and it does not include the City Clerk." He suggested that if anyone had a problem with that, to bring the matter up separately from the vote to go into closed session. "No," Newton objected, "as the wording of this pertains to official City business, we need to have the official keeper of the record there." Pierzchala responded that due to the "very sensitive information" being discussed in the closed session, he only wanted to "have the two people privy to the facts of this" in attendance. "You have included [Deputy City Attorney] Cindy Walters and [Deputy City Manager] Jenny Kimball....but I don't understand what their purpose is there," Newton said. "Their purpose is to take the notes," Pierzchala replied. "I'm requesting that we have the official record keeper, the City Clerk, Director of Council Operations...be the person who keeps the official notes," Newton said, "if there should ever be any question of what happened" in the closed session. "Kathleen Conway does not have any purpose in the meeting," Pierzchala retorted. "We have someone who will take the notes." "I am very concerned about what is going on, and what is not being said," Newton said. She added that the Mayor and City Clerk "have to legally attest to" the accuracy of the minutes of a meeting." Daniel disputed that, saying there is no legal requirement for those officials to sign off on the minutes. "But it's been a longstanding practice in the City, has it not?" Newton asked. "My understanding is that it started under Mayor [Phyllis] Marcuccio," Daniel replied. Newton asked her colleagues to weigh in, and their responses split along factional lines: independent Councilmember Beryl Feinberg said she thought it would be proper to include Conway, and that Conway could be trusted with confidential information as much as Walters and Kimball. 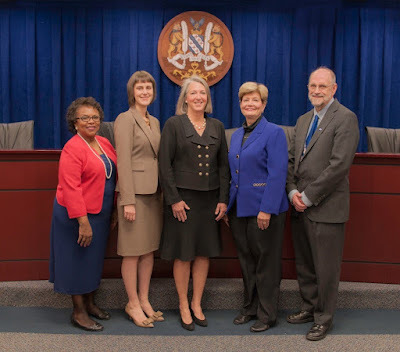 She and Newton were outnumbered by the Team Rockville faction on the Council, with Virginia Onley and Julie Palakovich Carr siding with Pierzchala. "Not that we don't trust Ms. Conway," Onley explained, "but it's not necessary for her to attend this meeting." Realizing the votes were not there to include Conway, Newton then called for a vote to go into closed session. But the matter didn't end there for some residents following the meeting. Not only did the exclusion of Conway increase speculation as to which land-use matter the closed session was about, but also what message the Council was sending to the City Clerk, and even potential violations of the Maryland Open Meetings Act. "It leads one to believe there was more going on than what was indicated by the reasons given for going into a closed meeting," Rockville resident Joe Jordan wrote to the Mayor and Council by email. "If anything outside those reasons was discussed, you would be in violation of the OMA." Saying the behavior of Team Rockville members "may have hit a new low for this council," Jordan urged them to improve their working relationship in the final two years of their term. Word from inside City Hall says that all of this was orchestrated by City Attorney, Debra Daniel. Daniel phoned (so as not to leave an email trail) council member Mark Pierzchala and asked that he make a motion to exclude City Clerk, Kathleen Conway, from the closed session that dealt with a “sensitive property acquisition” and coordinate with council members Onley and Palakovich-Carr. In order to justify a 3-2 Team Rockville vote to exclude, Daniel then provided Pierzchala with talking points for him to use against Newton during the November 13 Mayor and Council meeting, such as the ‘Marcuccio precedent.’ Part of Daniel’s scheme was an attempt to weaken Mayor Newton live on camera and damage Conway, who is a straight shooter and NOT in Daniel’s camp. The two people who replaced Conway in the closed session, Deputy City Attorney, Cindy Walters and Deputy City Manager, Jenny Kimball, have been co-opted, and in Kimball’s case, intimidated by Daniel to play along. The entire Mayor and Council, including Team Rockville members, need to replace Daniel with an honest and competent City Attorney in order for our City to move forward with complex legal issues. This really stinks! The official recordkeeper must be in attendance at every official meeting, period. We now have to wonder what Team Rockville has to hide. Team Rockville should be ashamed. They are an embarrassment to the citizenry. Watching the November 20th council meeting where there was a city council vote to not include the Rockville City Clerk and Director of Council Operations Kathleen A. Conway in the confidential session made no sense to me. What politics is going on to have this happen? I would like an answer? Who will explain the question to the public?